The Plug-In Browser command displays a dialog window which shows all of the extensions (plug-ins) which are currently loaded in GIMP, both as a list and as a hierarchical tree structure. Since many of the filters are actually plug-ins, you will certainly see many familiar names here. Please note that you do not run the extensions from this dialog window. Use the appropriate menu entry to do that instead. For example, you can run filter plug-ins by using the Filter command on the image menubar. 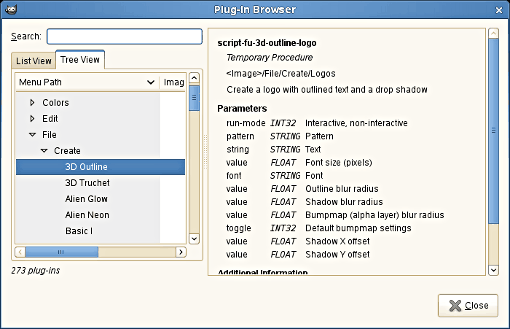 The figure above shows the list view of the Plug-In Browser. You can click on the name of a plug-in in the scrolled window to display more information about it. Select the List View by clicking on the tab at the top of the dialog. You can search for a plug-in by name by entering part or all of the name in the Search: text box. The left part of the dialog then displays the matches found. 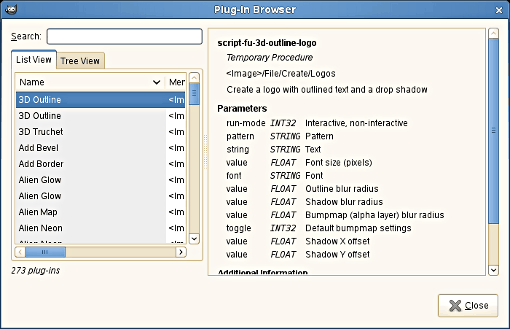 The figure above shows the tree view of the Plug-In Browser. You can click on the name of a plug-in in the scrolled window to display more information about it. You can click on the arrowheads to expand or contract parts of the tree. Select the Tree View by clicking on the tab at the top of the dialog. Not everything in these huge dialog windows is visible at the same time. Use the scroll bars to view their content.